Explore our new rugged towable line, No Boundaries! Our focus is creating exceptionally lightweight, versatile travel trailers towable by both 4 cylinder and 6 cylinder tow vehicles. 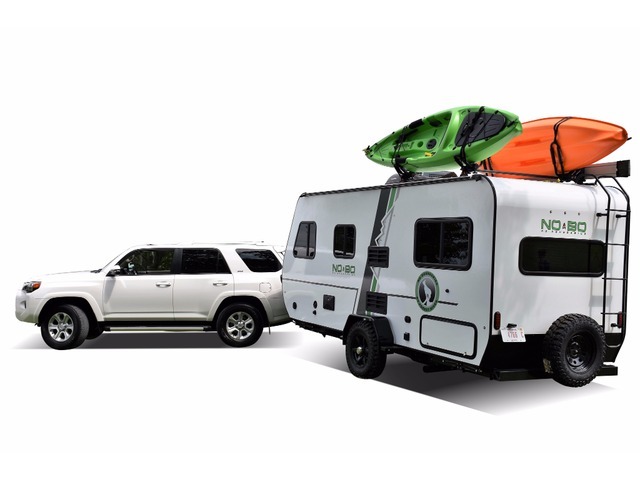 Perfect for any outdoor enthusiast, No Boundaries offers adaptable storage for kayaks, bikes, SUP’s, surfboards, skis, and fishing equipment, while still maintaining a dry weight acceptable for a wide range of smaller tow vehicles in the 1500-3500 lb category. No Boundaries, with industry-leading ground-clearance, larger diameter tires, and nimble suspension system, will allow you to explore and set up camp in places that would otherwise be inaccessible. Additionally, the upscale interior focuses on thoughtful, useful design with ample storage and an ergonomic and refreshing living space. Lengths range from 12’ up to 25’ and are attractively equipped with both familiar standard equipment as well as fresh features for a truly unforgettable adventure. Dry Weight 1,570 lbs Hitch Weight 210 lbs Overall Length 13' 10"
Dry Weight 1,606 lbs Hitch Weight 198 lbs Overall Length 13' 9"
Dry Weight 2,991 lbs Hitch Weight 312 lbs Overall Length 20' 0"
Dry Weight 3,478 lbs Hitch Weight 355 lbs Overall Length 20' 0"
Dry Weight 3,243 lbs Hitch Weight 324 lbs Overall Length 20' 1"
Dry Weight 3,456 lbs Hitch Weight 365 lbs Overall Length 22' 8"
Dry Weight 3,809 lbs Hitch Weight 388 lbs Overall Length 23' 8"
Dry Weight 3,789 lbs Hitch Weight 395 lbs Overall Length 22' 8"